Stefan Avram scored three goals in men’s soccer’s opening week. The men’s soccer game is 74 minutes in and Rollins and Wingate University have been in a 1-1 deadlock for what feels like an eternity. Finally, midfield engine Cyrus Siminou (‘19) makes an incursion in the middle of the Wingate box and up steps interim captain Andre Nansen (‘19). Nansen’s first cross is punched away by the keeper, only for the ball to land at his feet once again. He picks up Stefan Avram (‘19) who cooly heads it in to land his second goal of the night. The Barker Family stadium erupts as jubilant Tars surround their hero, securing the team’s season-opening upset against the nationally-ranked team. “It feels amazing to beat a No. 18 team,” Avram said. The Aug. 30 game would be the first of two wins for the Tars that week after defeating Regis University on Sept. 1. 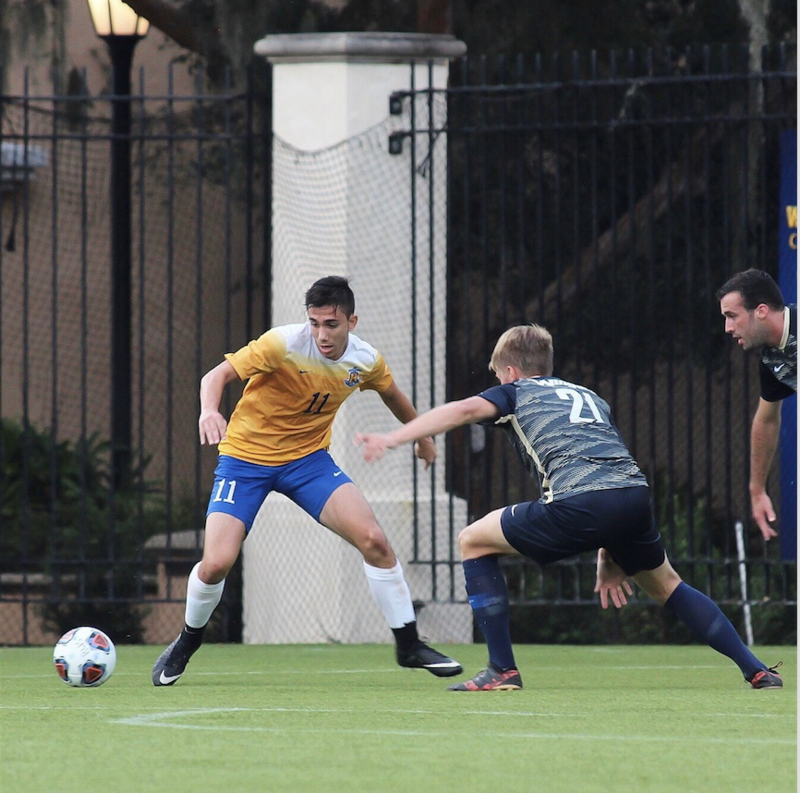 Avram secured three goals between the two games, earning him a title as the Sunshine State Conference offensive player of the week. With their performance last week, the Rollins men’s soccer team justified their fourth place ranking on the Sunshine State Conference Preseason Coaches Poll. This comes as no surprise to Head Coach Keith Buckley, who commenced his 28th season in charge of the Tars. “I think that poll was fair based on the players we have coming back and what we did last season,” Buckley said. The Tars will be relying on returning seniors such as Avram, Nansen, Johnny Nartowicz (‘19), and Damian Clarke (‘19) for leadership. Despite the positive start, the Tars will need to keep their feet on the ground if they wish to overcome the challenges they are faced with, including the sidelining of captain Ben Grant (‘19) due to a concussion. Buckley confirmed that the midfielder will not be on the field in the near-future. “The most important thing for him is to get well and to be able to do his classes,” Buckley said. The question of captaincy and leadership is imminent, considering the Tars currently have the largest incoming freshman class in a decade. However, stand-in captain Nansen does not seem too worried. The Aug. 30 match was also the first one for new Rollins assistant coach Luke Boden. The former midfielder has won three United Soccer League Pro trophies and helped Orlando City Soccer join Major League Soccer. Buckley lauded this new addition to his staff. “The players really relate to him. He’s got a good tactical understanding of the game and the more he coaches, the better he will be. We’re very lucky to have him,” he said. The season ahead is set in three stages for Rollins. The first phase consists of last week’s games which ended in wins. This weekend, the team plays the University of West Florida Argonauts and Spring Hill College. Then the challenging Conference matches await, with Conference play opening against the Florida Southern College Mocs, followed by tournament games. “We want to win the three remaining games in this phase, we want to be in the top two of our conference and then go into the tournament. That is how we aim to build the season,” Buckley said.